How many items in your closet beg to be worn but you have no place to wear them? Are they part of your past? Or, did you buy them with hopes they would be part of your future? We’re all dreamers and it’s easy to buy clothes for the lifestyle they promise instead of letting our lifestyle determine the clothes we buy. Lifestyles change at different stages in our lives – student, professional, working or at-home mom, re-entering the job field, retiring – and lifestyle transition can create a big change in wardrobe needs. A woman with young children who also works or volunteers could need a more varied wardrobe to take her from morning to evening than a business woman who spends most of her waking hours in an office. And the woman who retires from a long corporate career to adopt a more casual lifestyle of travel, volunteering, and golf might need to shift her wardrobe dramatically. If you never again want to cry “I don’t have a thing to wear!”, before you go on your next shopping spree, analyze how you really spend your time … then commit to making purchases that work for the activities in your current life. Do this periodically and the result will be productive seasonal closet edits and cost effective shopping excursions. 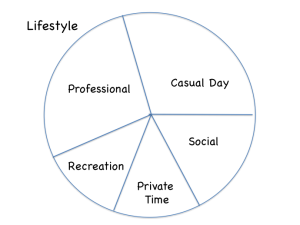 Ask yourself: What are the activities I spend my time in, and what is suitable and acceptable dress for those activities in the area where I live? Make a list of all activities you engage in during a month (either keep a diary and record this in real time or reflect back) and how often you do them – not how many hours you spend in each but how many days in the month you do it. Note: You might spend 8 hours in an office and only two hours dining out, but they could require two different types of clothing. If you’re a visual person like I am, you might find it helpful to note the time spent in the form of a pie chart, as I’ve done on the left, converting the number of days for each category into a percentage of the whole month – that is, a slice of the pie. 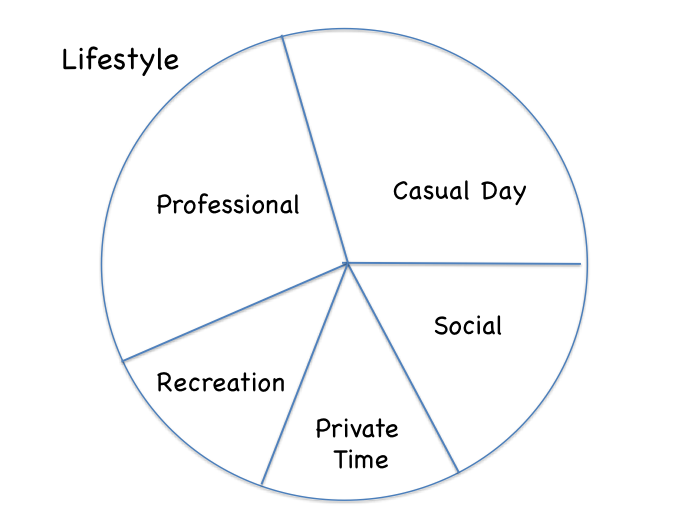 Now you need to know how much of what you own fits the lifestyle you are leading right now. 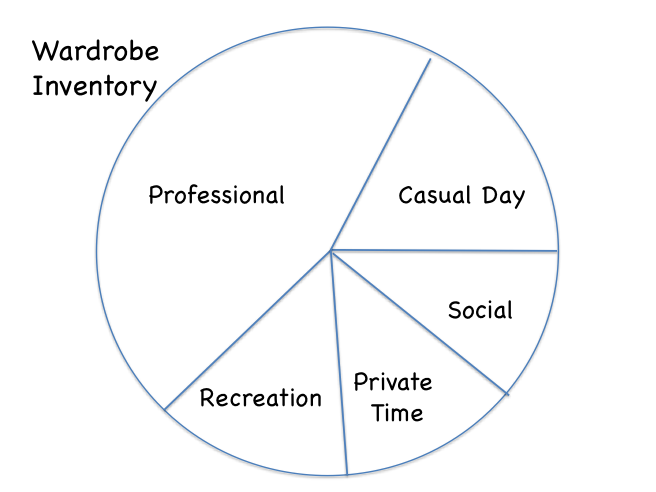 Look into your closet and inventory your wardrobe with your lifestyle chart in mind. 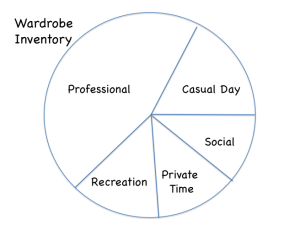 Ideally, your mix of clothing corresponds to the distribution of your lifestyle categories. When I made a transition from the corporate world, my wardrobe inventory told me my professional category was seriously over-represented in my closet. I made it a goal to focus on my more casual lifestyle with all new purchases … plus restyle some special pieces to fit my new lifestyle. If your clothing mix doesn’t match your lifestyle, make it your goal to bring them into balance! Now it’s time to make some decisions. The ideal wardrobe holds items that fit the lifestyle you have now. Anything else is taking up valuable space and not paying its way! What should you part with? If an item no longer meets your need – or you think it never will – can it be restyled or combined with more lifestyle appropriate items in a brand new way? 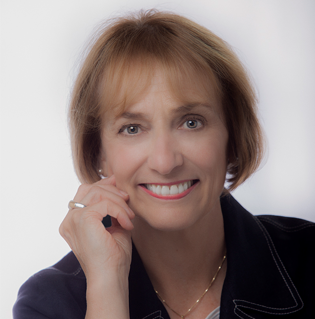 Here’s where the help of a skilled professional wardrobe consultant can be invaluable! Begin now to weed out of your closet any items that simply do not support your lifestyle today and cannot be restyled to do so. There are several ways to donate this clothing, as I’ve covered in a previous post. Where do you need to build a wardrobe that really works for you? Focus your future shopping on the lifestyle categories that are not represented enough in your closet. A wardrobe that is streamlined to align with your lifestyle makes your life easier and getting dressed more enjoyable! If you would like more guidance plus a personalized approach to building a wardrobe that works for your lifestyle, contact me today for an in-person or virtual consultation. Our first half-hour together is complimentary! Leslie–this is so appropos! The clothes in my closet no longer match my lifestyle changes. I have too many past professional clothes in my closet and stored under the bed! A friend has advised some YWCA’s have a way to donate “professional” clothes to young career girls who cannot afford a proper wardrobe. I am researching this in my neighborhood. Your blog I received today is now even more of a prompt for me to “get my act in gear”!!! Thanks much!! You are welcome, Rosemary, and good for you! We all tend to hold on to good clothing for emotional reasons and understandably so. I love that you are looking into how you can use your former professional wardrobe to help others. Another organization for you to look into is “Dress for Success” and I suspect Los Angeles has a chapter. This is so true, Leslie! Love how you broke it down into the pie chart. Let’s get together soon! Thanks much, Ann … the Pie Chart is good visual for those who want to go beyond a list!